How many times have you come across fictional lead detectives or Senior Investigating Officers (SIOs) with no idea where they came from? It’s almost as if they were born a lead detective or joined the police to automatically become one. I’m sure that you already know that in the UK, it isn’t possible and never has been for a person to join the police as a detective, let alone a Senior Investigating Officer. You’ll no doubt also know that it’s not possible for any old cop to get to those dizzy heights without the right amount and type of experience or training. Now, if you are reading the nth book in a series, it may be that the SIO’s development and career progression are discussed in earlier book in the series but in all likelihood, there will be no mention of how they got to the pinnacle of their career or what they had to do to become the leader of a complex murder investigation. The reason that you will come across such instances and maybe even be guilty of doing something similar yourself, is probably because not many authors happen to have a close relationship with a police officer who has years of experience of policing in the UK that they can call upon to answer accurately and reliably, their troubling questions about the police, their policies and procedures. Maybe no-one has taken the time to explain to you or the writer of the story you are recalling, just what it takes to become an SIO and lead a murder investigation in the UK. But never fear. Help is at hand for those of you wanting to learn about what it takes for a police officer to become an SIO and thereby make your lead detective more credible and identify areas where conflict may stem or opportunities arise from. There are also hyperlinks to 79 websites or documents that you may find useful in building up your understanding of what a Senior Investigating Officer needs to know and apply during a major investigation. 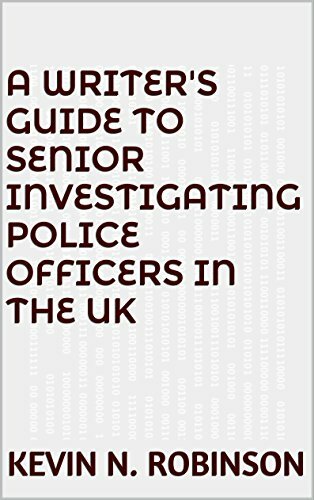 Not only will this book provide you with details of how a police officer can become a Senior Investigating Officer but it can help with plotting your novel and creating twists and conflict along the way. It’s crammed full of expert knowledge and advice that you can use to captivate your readers with compelling dialogue and narrative. I have never felt compelled to write a review before but in this case I felt it only right to do so. I am an ex-police officer in the middle of writing my first crime-related novel and I have to say how invaluable this book has been to me. I thought I was doing well with my descriptions of procedures and command structures but I cannot believe just how much the job has changed since I left. If I hadn’t bought a copy of this (I also have the authors other titles) I would have made myself look like a rank amateur stuck somewhere in the 90’s. This book has saved me hours upon hours of research and helped me re-think certain parts of my book and for that alone, thank you Mr Robinson. I only wish these books were available in paperback format. I’d have a copy of them as well. Call me old fashioned, but I like a book I can flick through and mark up where necessary and as much as Kindle comes close to a book experience it doesn’t really work quite as well with this kind of book in my opinion. That said, no other format allows for hyperlinking to other valuable resources so, swings and roundabouts. All in all, a superb, densely packed no fluff resource that is worth far, far more than what it is being offered at.